Last Updated: March 19, 2019 · Published: April 11, 2017 By: Asian Caucasian Leave a Comment This post may contain affiliate links or sponsored content. 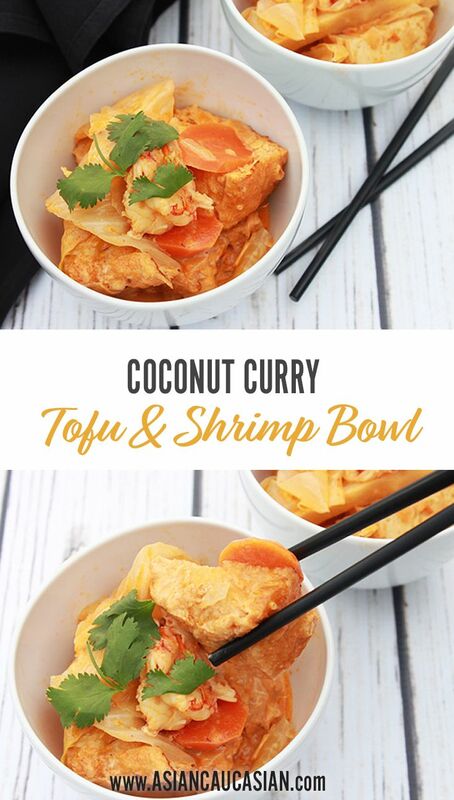 Who doesn’t love a good bowl of coconut curry tofu and shrimp, am I right? Damien, my right hand man, treated me and my husband to this recipe recently which was so yum! 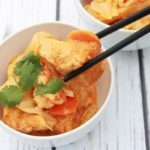 It’s full of veggies and shrimp, and flavored with the goodness of curry, lemon grass, hot chili paste, and coconut milk. I combine light coconut milk with regular to make it a bit healthier. Or, you can use coconut cream which is a richer stock, but adds more calories. You can also top this dish with hard boiled eggs for extra protein. I’m a tofu freak so I use these soybean cakes in everything! Make sure to use the extra firm tofu so it doesn’t fall apart. 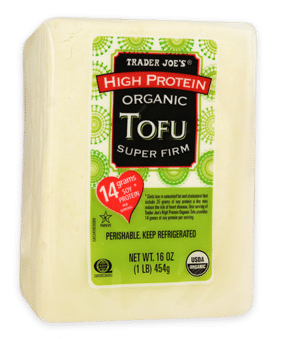 Trader Joe’s is my go-to for dense tofu. You’ll find it in the dairy section. Treat yourself to this recipe full of yumminess tonight! Trader Joe’s Super Firm Tofu is the best product for this dish! Won’t fall apart! 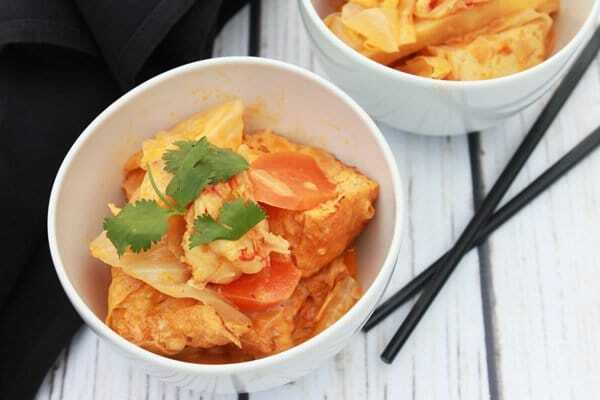 Rich and hearty, this curry tofu and shrimp bowl is absolutely delish for entertaining! In a large stock pot, sauté the garlic and shallots with oil until golden brown. Add in lemon grass, dried shrimp paste, red curry paste, and sambal oelek. Cook for 5 minutes, then add in the carrots, turnips, green cabbage, and tofu cubes. Continue to cook for another 5 minutes. Stir in the coconut milk and water. Once ingredients are well-combined, bring to a boil, lower to a simmer, cover and cook for about 15 to 20 minutes. Toss in the shrimp and cook until pink, about 2 minutes. Top with hard boiled eggs when serving. Optional: serve with steamed rice and garnish with fresh cilantro. To bake the tofu: Place entire blocks of tofu in a toaster oven at 275 degrees. Bake for 15 minutes until brown on outside. Remove and let cool before cubing.